For passenger inland water transportation, solar ferry boats are not just eco-friendly but they also make economic sense. They can completely replace diesel ferry boats. India has about 14,500 km of navigable waterways which comprises rivers canals backwaters creeks etc. Transport by waterways is highly underutilized in India compared to other large countries. Water-based transport is characterized by low operating costs of fuel with the waterway the main infrastructure being naturally available without much maintenance and upgrading costs. In addition, there are many water-logged areas in Bengal, Kerala and Goa which can only be accessed through water transport. Currently only 0.5% of movement is in inland waters. It's possible reach the level of nations like China (10%), Germany (20%), if not Bangladesh (35%) with some thrust in policy support by the Government of India. BWDisrupt spoke to Sandith Thandasherry, CEO of NavAlt to know more about this unique venture. He also serves the position of Managing director. With a B-Tech in Naval architecture from IIT Madras & MBA from INSEAD, he also has more than 16 years industrial experience. He is also the co-founder of Navgathi. NavAlt Solar & Electric Boats Pvt. Ltd. is formed in 24th October 2013 under the ownership of Navgathi Marine Design & Construction Pvt. Ltd. (India), Alt.En (France) and EVE Systems (France). 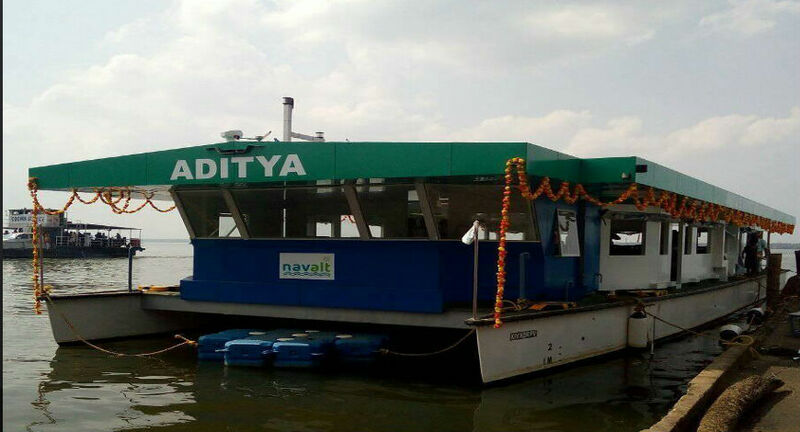 Since 2009 Navgathi have been building solar powered cruise boats of smaller capacity and solar fishing boats and soon realized that the biggest and commercially viable sector is large passenger water transport boats. BW: How did the team/partners of this solar ferry company come together? BW: What's the USP of your product and tell us about its key features? NavAlt was to design and build solar and electric boats for the Indian market. Our focus is on innovation. Firstly, the boat is much better designed for passenger comfort (modern, light composites instead of steel/wood, good interiors and design). Most importantly, our boats are completely eco-friendly with no fuel on board. Conventional boats using petrol or diesel engines produce volatile emissions polluting water and air, noise and vibrations that discomfort the passenger and eco system. Moreover, these conventional boats are fuel guzzlers. Solar or electric boats are economic as they have zero operating cost and maintenance cost. India has about 14,500 km of navigable waterways which comprises rivers canals backwaters creeks etc. Transport by waterways is highly underutilized in India compared to other large countries. Water-based transport is characterised by low operating costs of fuel with the waterway the main infrastructure being naturally available without much maintenance and upgrading costs. In addition, there are many water-logged areas in Bengal, Kerala and Goa which can only be accessed through water transport. In states like Kerala and West Bengal where water transport system is extensively used. We are also looking to introduce this solar ferry model in other Asian countries where sun is very abundant. Maldives, Sri Lanka, Nepal and other South East Nations are also our target. BW: Can solar boats replace the traditional inland waterways? Is it commercially viable? Solar ferry boats can completely replace diesel ferries for passenger transport. 50 days of operation of ADITYA has shown the benefit of solar ferry and its commercial viability. We have been researching the application of solar powered boats in different sectors like cruising, fishing etc. since 2009. It is understood that the most commercially viable model is mass passenger transportation or ferry service. The cost per passenger will be very low in such boats as they run for around 10 – 12 hrs. on 365 days and gives an economic sense. BW: How expensive would solar boats be compared to traditional boats? BW: What would be the ideal passenger carrying capacity of these boats? Or is there anything as such? 75-100 passenger would be ideal. Larger ones up to 150 is suitable in certain locations and small ones like 30 passengers is suited for areas and sectors with less passenger movement. We have the capability to build solar ferries from 30 to 150 max capacity. 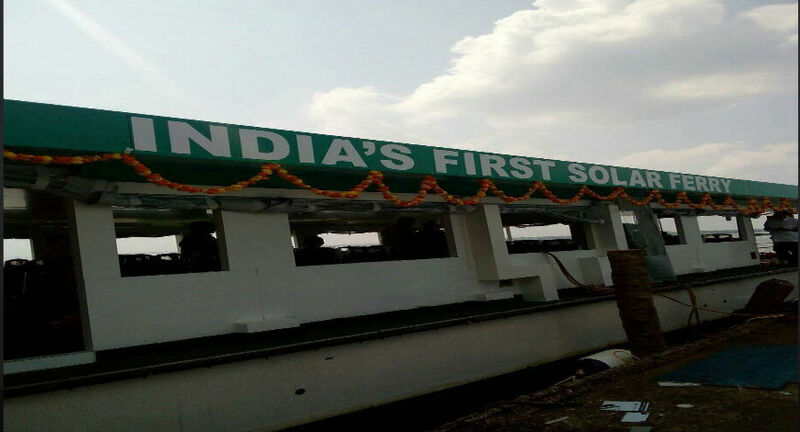 India’s first solar ferry is 75 seated. BW: Do these boats get charged simultaneously with ferrying passengers or that has to be done separately? How long do you need to charge them? And what is the distance it can cover in fully charged condition? Yes the boats will be charged from solar even when its ferrying passengers. During the peak sun time (11 am – 3 pm) the solar charging will be very fast and non-peak time charging from sun will be comparatively slow. Charging time depends on the size of the battery bank. Most of the large solar boats are designed for recharging in 6 hours. In our 75 passenger solar ferry 50 kWh battery bank is used and it will take 5-6 hours to recharge this battery bank from full discharge. However on normal days it gets discharged less than 50% and hence take less than 3 hours to charge. At night when vessel is docked, we can use the utility grid to charge the battery bank, which can help to start the vessel with full battery capacity in the morning. Endurance or range of a solar boat depends on the energy storage in your battery and energy produced from solar modules flowing to battery. On a sunny day with clear sun, the range will be increased. It also depends on the environment like wind speed, current, waves etc. which will affect the propulsion power.Solar ferries are usually designed for 6-8 hours range on a sunny day. The most common apprehension is what happens during the rainy season.What would you say? Whether its sun, cloud, rain or night it works, but endurance varies. During a cloudy day, the production from the solar module decreases but production is not zero. If you want extended range during night or cloud, we can increase battery bank or provide intermediate charging from grid. BW: How much have you invested so far? 50 lakhs in R&D and another 100 lakhs in working capital that is yet to be received in final stage. BW: How many boats you have made so far and what is your present capacity? BW: Are you looking at any fresh investments either for ramping up capacity or for something else? BW: Are you also exploring some neighboring countries' markets, where there are thriving and vibrant inland waterways system?